Guide book is what you can count on whenever you plan for a tour to any part of the world. 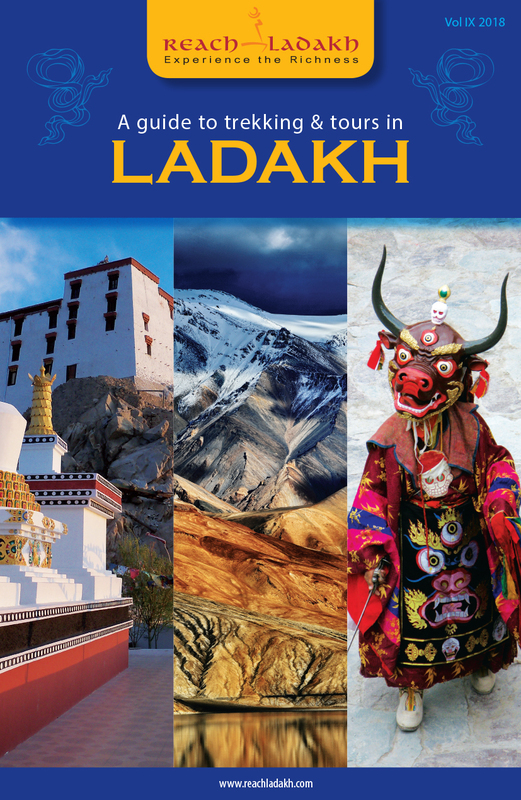 Consequently, Reach Ladakh has come up with its latest travel Guide book planned to assist the several activities especially of road trippers. This guide book will help in planning and driving routes, sightseeing, and stopping to eat and sleep on the way. Enchanting the appraisal by our fellow travellers, and motivated by you all, this Ninth Edition of Reach Ladakh covers all of Ladakhís maximum characteristics, new detailed maps along with supplementary attractions like Ladakh's Flora and Fauna, trekking routes, food, art, restaurants, countryside attractions and so on. Reach Ladakh guide book contains the well-organized information of multipurpose to visit in Leh Ladakh. Specially designed for all the visitors across the globe who desires to understand more fully what he or she sees. New destinations are also added, for instance Turtuk, Lastang, Sanjak and many more. All the places are recommended in the guide book is worth visiting. This edition of 2018 new guide book will help all the travelers in planning a wonderful trip to Ladakh. Reach Ladakh Guide Books are available in every Book Shop in Leh. How to order Reach Ladakh Guide Book : Write to us on the address given below for your copy. We will send your copy through VPP within India. Foreigners (People outside India) should send a draft worth US$ 12 + 2 as postal charges in favour of Reach Ladakh Publications.